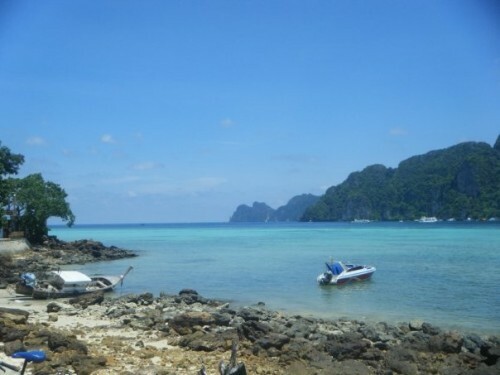 In 2009 I spent a month backpacking Thailand, Malaysia and Singapore and I absolutely loved it. The abundance of delicious food, gorgeous beaches, vibrant culture and some great beach parties made it a trip of a lifetime that will be forever held in my heart. However, since this was BC (Before Chocolate became such a huge part of my life), it was not a Cocoa Adventure. 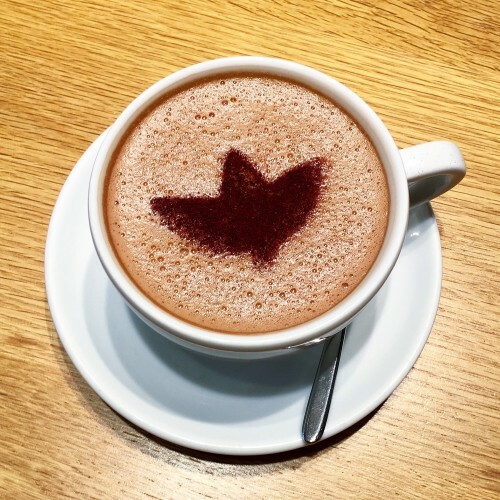 Prior to my trip to Vietnam, I had experienced five wonderful Cocoa Adventures. 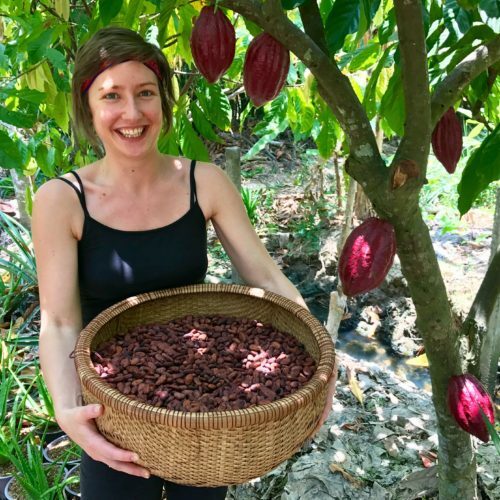 All of these Cocoa Adventures were in the Western side of the world (Central America and the Caribbean) and a few months ago I felt a calling to head East and return to Asia and experience my first Asian Cocoa Adventure. 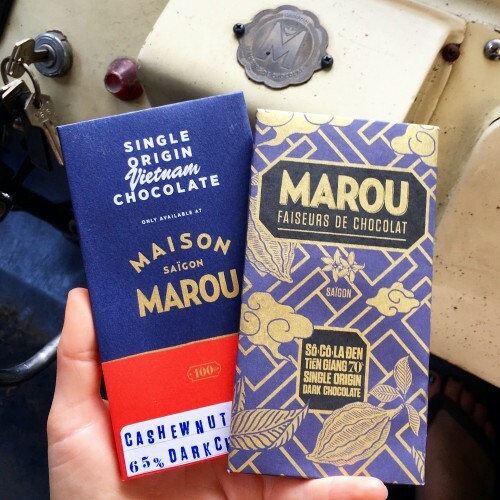 From first bite I have adored Marou Chocolate and I also wanted to visit a country that I hadn’t been to before, so I followed my taste buds and decided to visit Marou Chocolate in Vietnam. I messaged Sam Maruta (Co-Founder) and shortly afterwards a flight was booked! 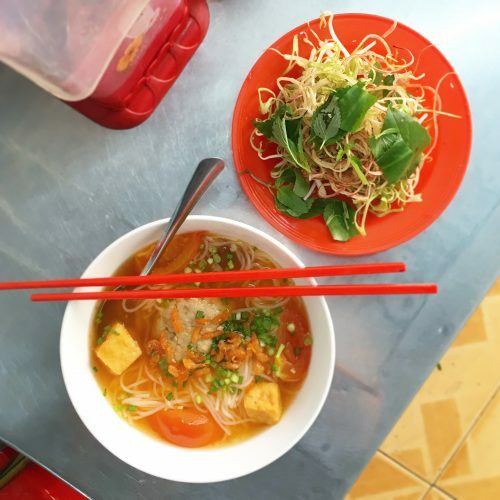 I flew to Ho Chi Minh City over the Easter Weekend (to take advantage of the bank holidays) and spent nine and a half days in Vietnam. On my very first morning, Sam invited me to the factory to join a tour with some of his daughter’s friends from school. From the street outside, one would have no idea that there was a chocolate factory making some of the most delicious chocolate in the world just on the other side of the wall. 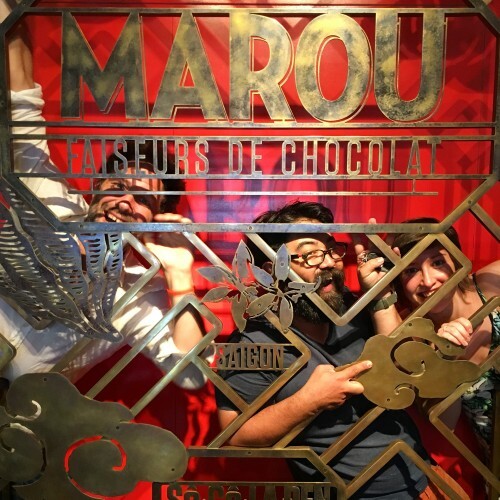 We couldn’t find the famous “Marou” sign that many visitors have taken their photo with, so we posed next to a chalk board in the cacao warehouse before we entered the factory. Sam guided us around the factory. There were separate rooms each for roasting, winnowing, grinding, tempering and moulding. The beans are roasted in batches and cooled, cracked and winnowed in the winnowing room, then added to the wet grinders in the grinding room. Marou grind the nibs alone for 24 hours before adding the sugar for a further 24 hours making a total of 48 hours grinding and conching. 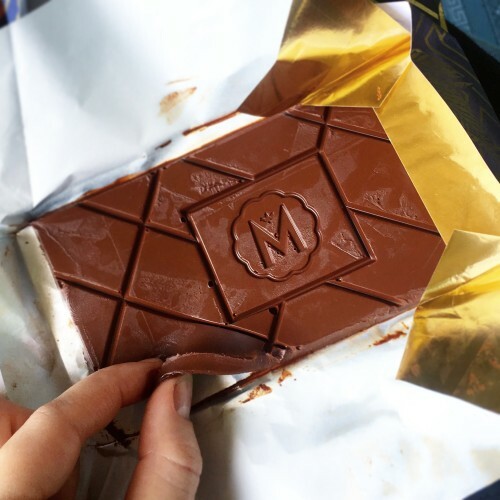 At the time, Marou were processing around 100kg of chocolate per day with 5 members of staff wrapping 2000 bars per day! 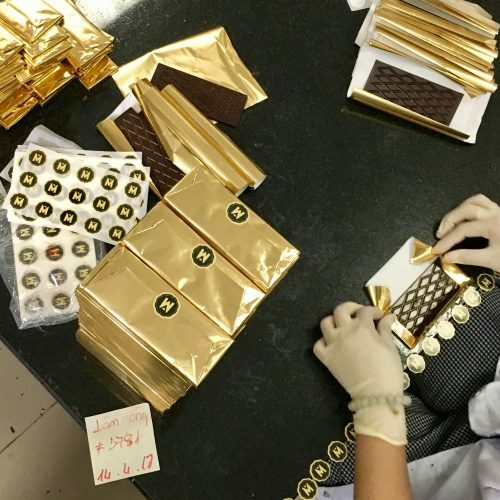 Wrapping the delicious golden bars! 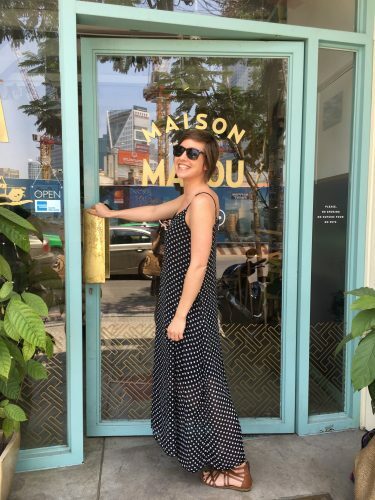 After the factory tour, we headed back into the city to the just-turned-one-year-old Maison Marou Saigon (Marou’s new chocolaterie/cafe/shop/chocolate factory). This place is a chocolate lover’s sanctuary. Cocoa trees surrounded the entrance of the shop and fresh cocoa pods were nestled between the glimmering gold and multicoloured bars. Jars of freshly roasted cocoa beans waited in the centre of each table for customers to help themselves (in case there wasn’t enough cacao in the chocolates and patisserie!). There was a roaster right next to the entrance which filled the shop with the intoxicating aroma of freshly roasted beans. Only tall glass windows stood between the customers and the pastry chefs, chocolatiers and makers, maximising the experience for the customers. 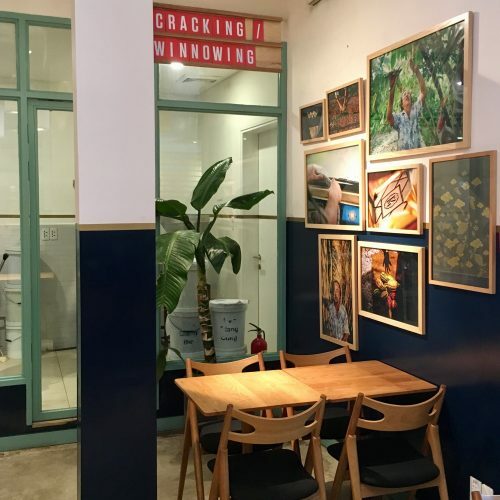 Since my visit, Marou have opened up a second Maison Marou in Hanoi! 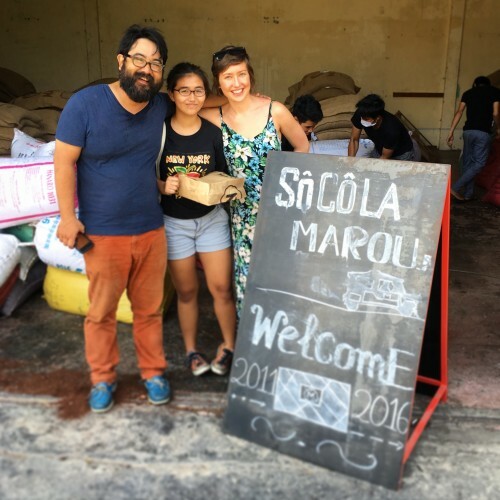 Maison Marou has its own set of bars using a 65% couverture made on site with a blend of origins from within Vietnam. 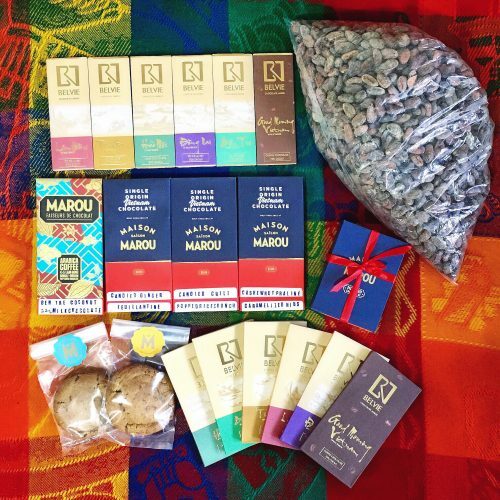 The Maison Marou bars are all flavoured with Vietnamese ingredients and include: Caramelized Nibs, Candied Ginger, Candied Chilli, Cashewnut Praline, Popped Rice Crunch and two “Origin Plus” bars: Ben Tre Coconut Milk (using coconut milk from the same region, Ben Tre) and the latest bar Lam Dong & Arabica Coffee (using Arabica coffee sourced from Lam Dong). 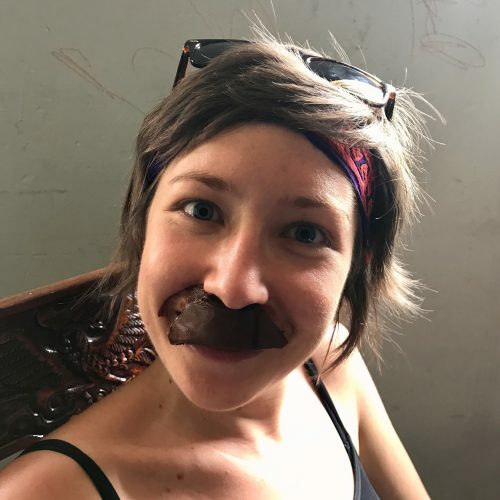 I joined Sam on his cacao sourcing trip to the Tien Giang region. Tien Giang is not too far from Ho Chi Minh City so we managed to visit a few farms during a one day trip. 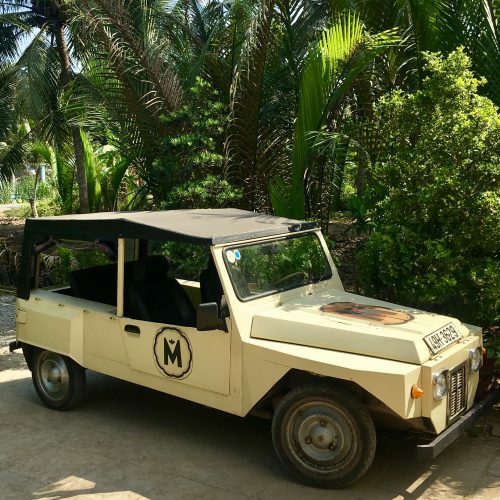 Sam picked me up in the Marou Mobile and I was so excited to travel to the cacao farms in style! Of course, I had to bring some snacks with me for the journey and to share with the farmers. 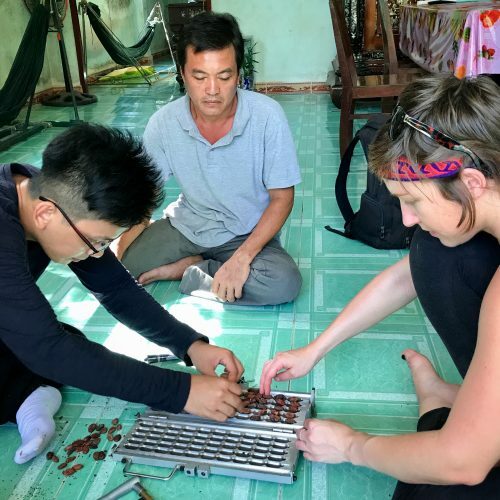 I took my two favourite Marou bars: the 70% Tien Giang (appropriate for the origin we were visiting!) 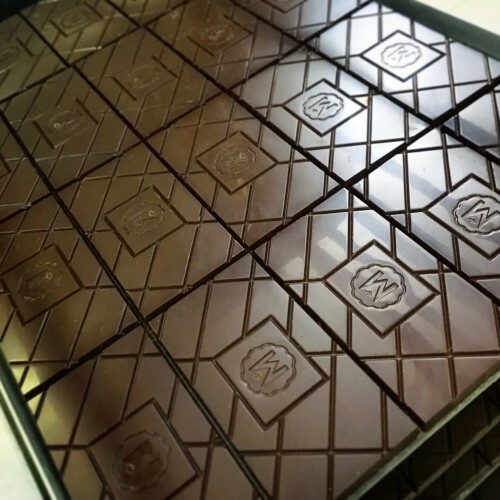 and the Cashew Nut Praline bar, made on site at Maison Marou. I sometimes think that I was born in the wrong country because I absolutely adore the tropical, warm weather. The chocolate was suffering more than me and went from solid to bendy to liquid. 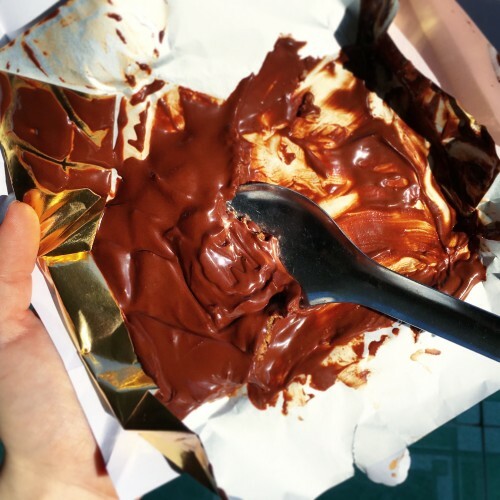 I was surprised by the state of the chocolate because I felt very comfortable with the temperature; I couldn’t believe that the chocolate had turned liquid! 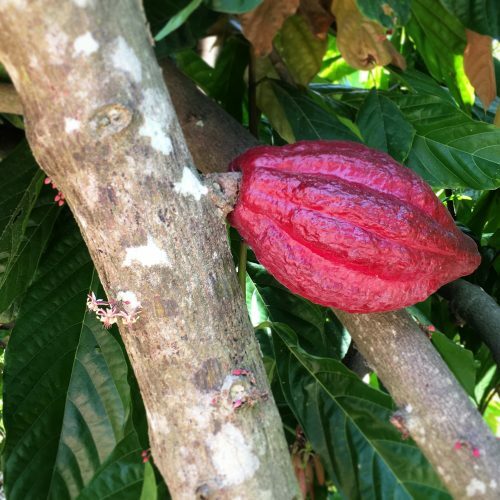 As with previous visits to cocoa farms, I felt this instantaneous excitement as soon as I got near the cacao trees. There is something very special about this plant that has created so much magic in the world! And what a beautiful tree we were greeted by at our first farm visit: a Forastero tree with big, round and beautiful red pods! We visited 3 different cocoa farmers during our day trip. 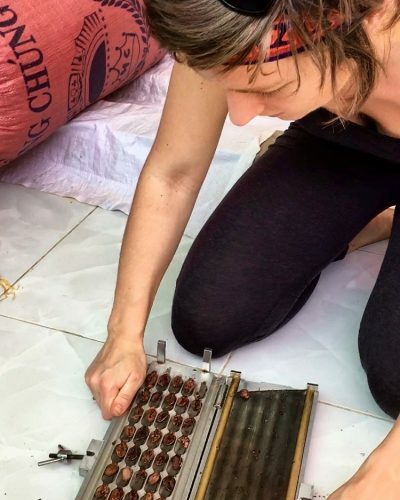 A sample was taken from each sack of beans and analysed using the cacao bean guillotine. The guillotine has 50 cavities and slices through the middle of the beans. 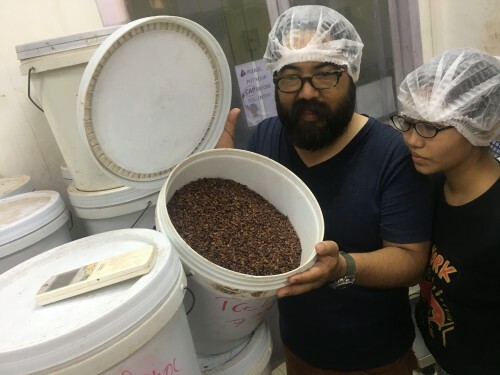 The quality of the fermentation of the beans can be assessed by eye. The properly-fermented beans are counted and a percentage is calculated and recorded. 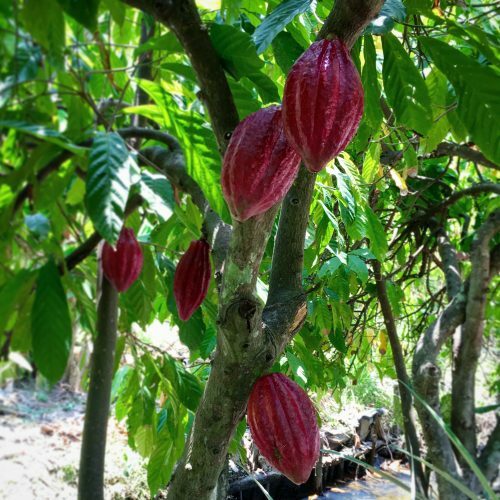 The percentage of fermented beans is used to grade the cacao. Each grade is priced differently and the beans will be used differently (for single origin bars, a couverture blend or used for cocoa butter). We tasted some of the beans after the cut test and I found the flavours fascinating. Some of them tasted just like cinnamon! Others had a variety of different flavours. After my time in the south of Vietnam, I travelled further north in Hoi An (halfway up the country) to see a different part of the country. I found a little chocolate shop called Coco Box with some interesting Vietnamese-flavoured chocolates and bars. 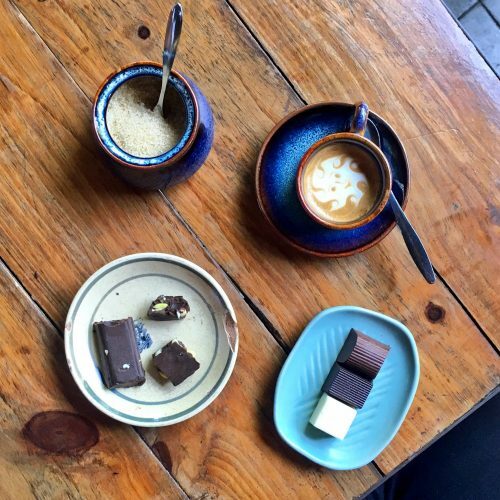 I tried the Coco & Co: coconut, white chocolate and rum, the Honey: black chocolate with a longan honey from Mekong, the Cashew Praline: finely ground cashew covered in milk chocolate and the Hoi An Spices Dark Chocolate bar: star anise, black pepper, peanuts, sesame and cinnamon. I loved tasting all of the spices in combination with the nuts and sesame seeds! 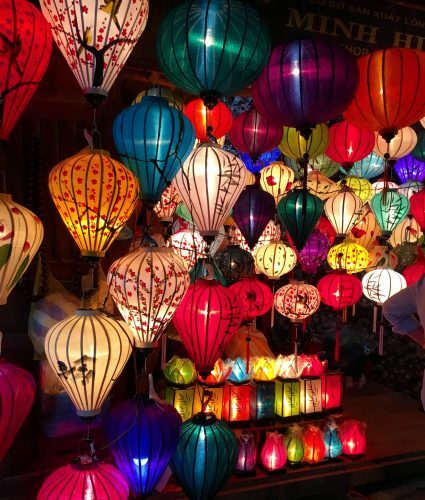 Hoi An: possibly the prettiest town I have ever seen! 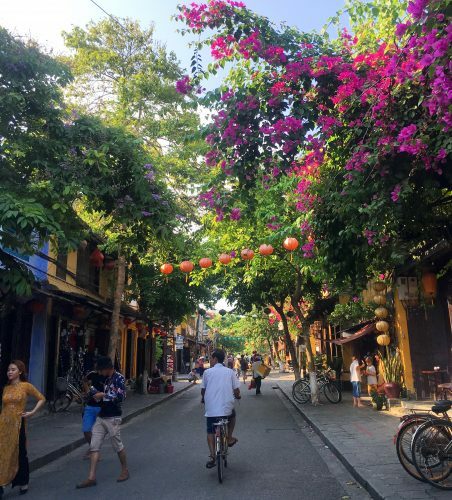 I spent my time in Hoi An cycling around the beautiful streets, shopping for Vietnamese clothes and crafts, attending yoga classes and eating as much Vietnamese food as I possibly could. I find Asian cuisine to be the most complex and interesting in terms of flavour. 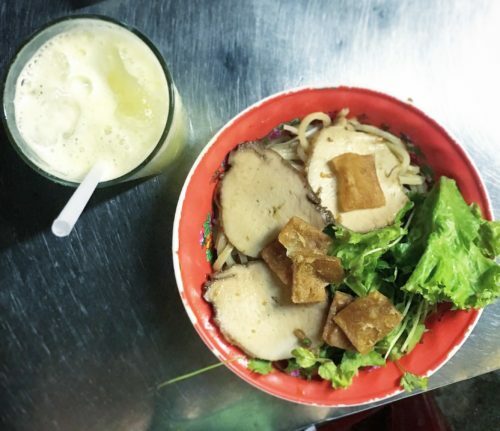 Cao Lau: Traditional dish from Hoi An with thick yellow noodles, salad, pork and pork crackling. I had mine with a freshly squeezed sugar cane juice. 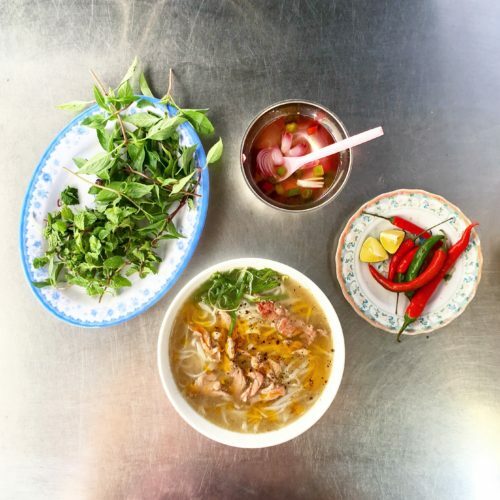 Pho Bo: probably the most popular dish in Vietnam and my favourite of the trip: beef noodle soup served with chillies, lime, bean sprouts. I just couldn’t get enough of this! 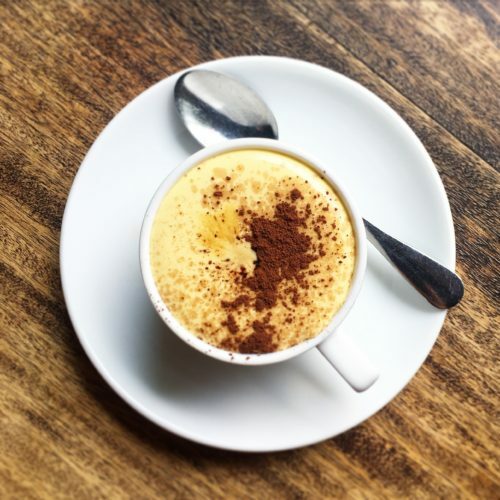 Egg coffee: essentially coffee whipped with egg yolks to create a soft meringue. I thought that the foam would be on the surface only, like a cappuccino, but as a dived in with a spoon I realised that it was the entirety of the drink (or dessert!). It was too rich for me. 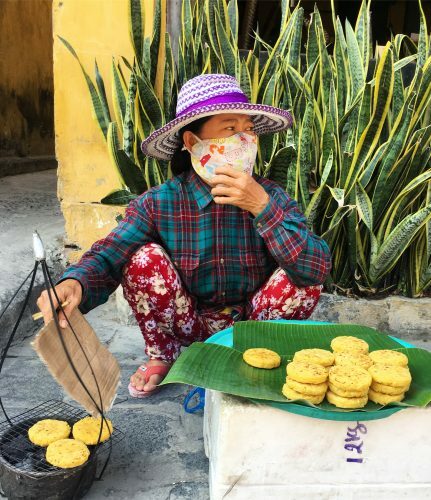 Corn cakes: sold on the streets of Hoi An and warmed up on the portable stove before serving. 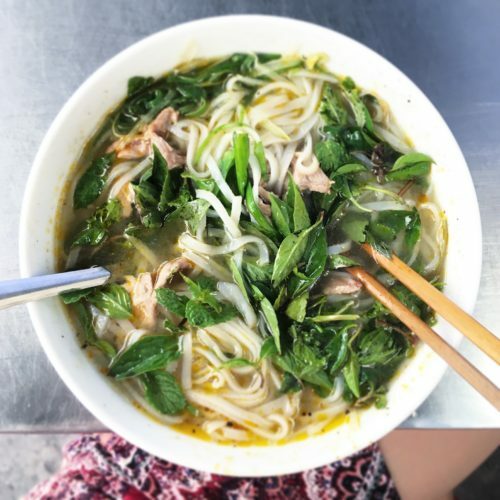 Bún Riêu: a traditional Vietnamese soup with rice noodles, stewed tomatoes, crab dumplings, tofu, dried shrimp and, of course, a side of fresh aromatic herbs. 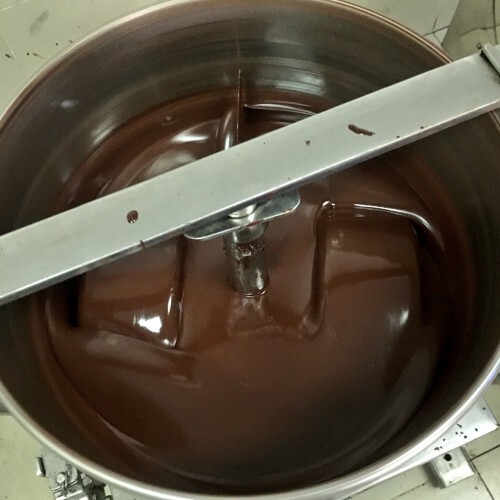 I returned to Ho Chi Minh City for one last day and I visited the more recent chocolate makers: Belvie Chocolate. 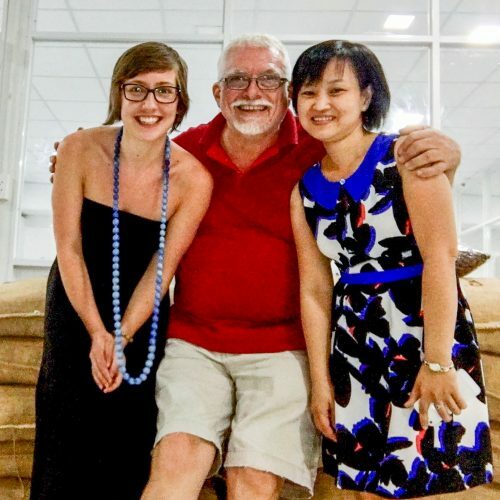 Their factory was on the outskirts of the city and is run by Marc from Belgium and Jannie from Vietnam (hence the name, “Bel” from Belgium and “Vie” from Vietnam). Belvie use the same grinders as Marou but grind for 3 days instead of 2. They have fewer machines but a good space to fill as they develop the business. 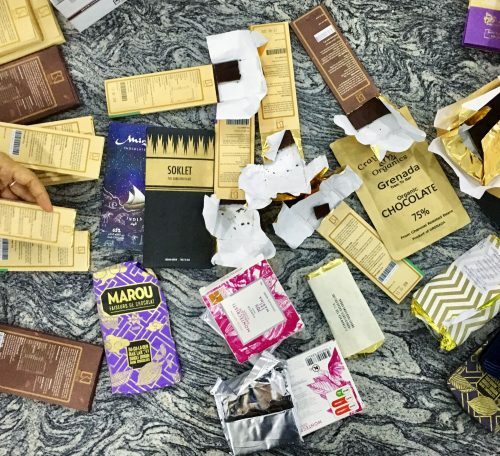 We shared plenty of chocolate from my collection and theirs and discovered some interesting flavour notes such as lychee and black tea in their Dong Nai bar and cranberries in their Lam Dong, for which they won a Gold Academy of Chocolate Award for this year! It was a truly wonderful afternoon of chocolate-chat and tasting and I am so happy that I managed to visit them during my trip. Just before heading to the airport I stopped by Maison Marou to stock up on supplies: chocolate chip cookies (I am not that into pastry but I do love a good cookie! 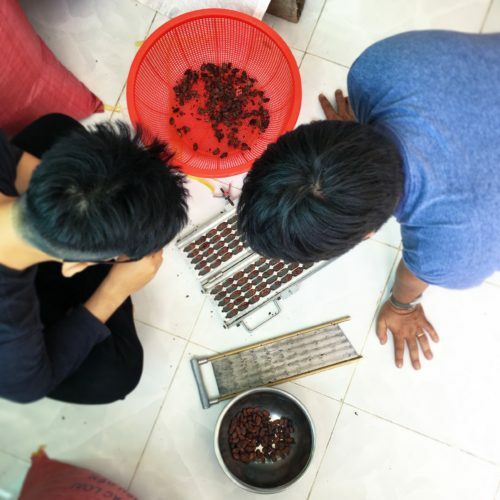 ), plenty of bars, some Vietnamese-flavoured filled chocolates and also some beans: Tien Giang and Lam Dong from Marou and Ben Tre from Belvie. Thank you very much for sharing with me! Vietnam, you were well and truly delicious and I was so happy to be back in Asia. The trip reminded me of how much fun I had during my trip to Southeast Asia in 2009 and I have already booked my next trip back to Asia visiting another new country: India! Huge thanks to Sam Maruta for spending so much time with me!